Today I went home earlier from work because my ankle hurt so bad. So my left ankle was sprained last night when I was walking to a Trans Jakarta shelter and this morning it was swollen. I went for a healing massage and Alhamdulillah its getting better. Aside from my swollen ankle, I have some extra time to blog. Yay! 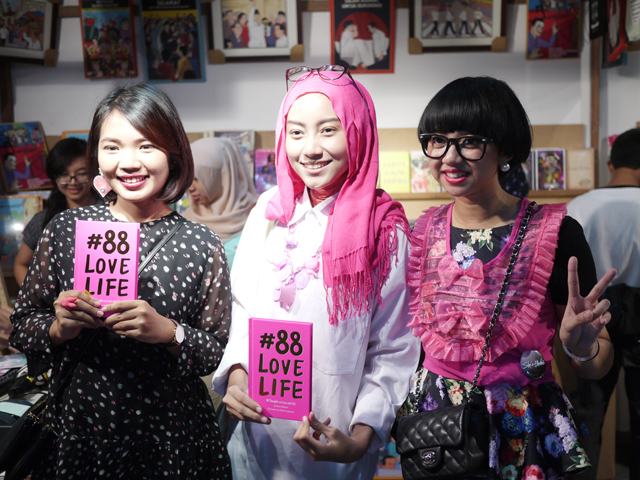 As I told you in my previous post, last weekend was the soft launch and meet and greet of #88LOVELIFE, my collaboration book with Diana Rikasari. Some of you might have guessed that I was making a book with her, when we posted the teaser on Instagram. 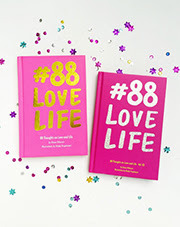 And yesss you are right, the book is called #88LOVELIFE! I first saw Diana in Gogirl magazine back when I was still in college, my thought was "Wow, this girl is very unique!". Then I checked her blog and reading her blog became my routine. I drew her for several times before I knew her in person, its simply because because she is so colorful, fun and inspiring. Illustrating her made me happy. I was so excited when she posted my illustration of her in her blog. In 2010, I ran an accessory line called Pretty Odd with my college friend. We were so new in the online shopping industry, so we randomly sent a promotional email to a lot of bloggers. Days after days, we had no order. One day, an email popped in Pretty Odd's mail box and we both were screaming soon after we read the email. Diana dropped an order, she was our very first customer!! A year after, I was working in Ogilvy and handling Pond's Teens Concert press conference. We invited Diana as one of the speakers and it was the first time I met her. She was soooo kind and humble - the best part is she remembered Pretty Odd. I met her a few times after that, for work, at a concert, at my client's event, and malls. I really wanted to talk and have a long conversation with her, because I think Diana is a very smart person with an amazing personality. Long after that, when I launched my first book, I sent her one. 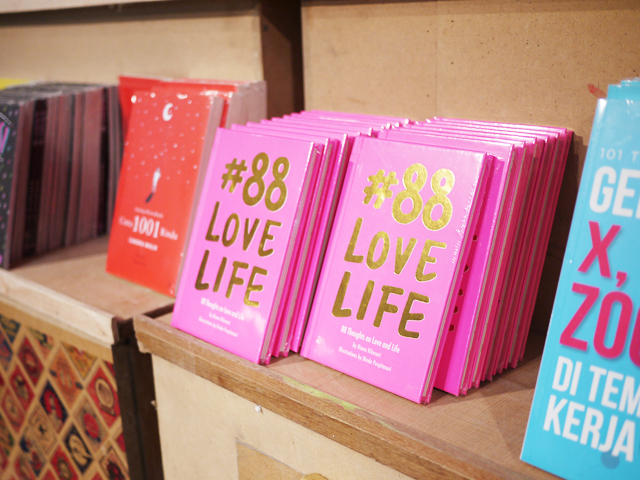 I never thought that it was the first step of #88LOVELIFE. Diana asked me for a collaboration to make a book. Of course I said yes! 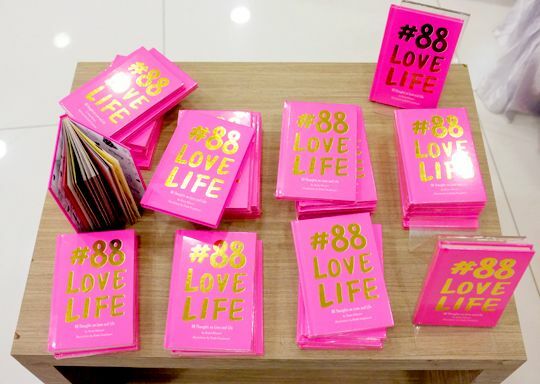 The process of making #88LOVELIFE should be done in around one to two months. But since I'm also working 9-5, so it was dragged for three months, which caused a little bit of depression because I felt that I was responsible for the delay. 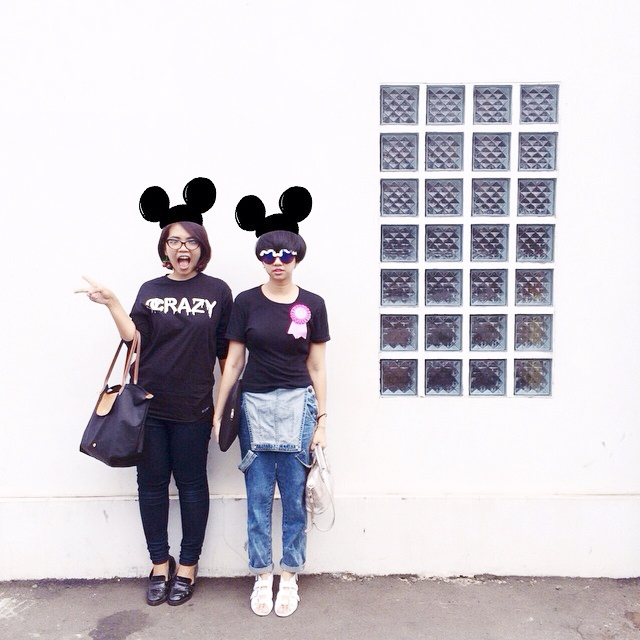 But Kak Diana is always a very supportive partner, she brought my mood back. She understood whenever I had a creative block. She gave me feedbacks, important feedbacks, but she still let me to play around my area. Working with Kak Diana is so much fun (and so many selfies hahahaha). We spent hourssss together whenever we met to discuss and finalize things. 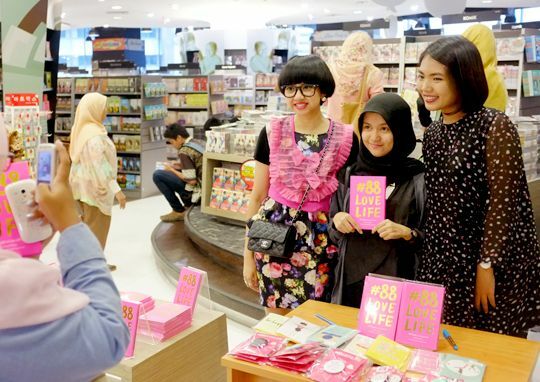 I love that I can talk about blogging, fashion, creative things and marketing all together with Kak Diana. Before I had this project with her, I was confused about whom I can talk to about those things I love? Well, I have close friends, but they don't really have the same interest about blogging, style and creativity as much as I do. Simply it feels so good to find a person who checks on Instagram as much as I do hahahahahaha. I love collaborating with her. 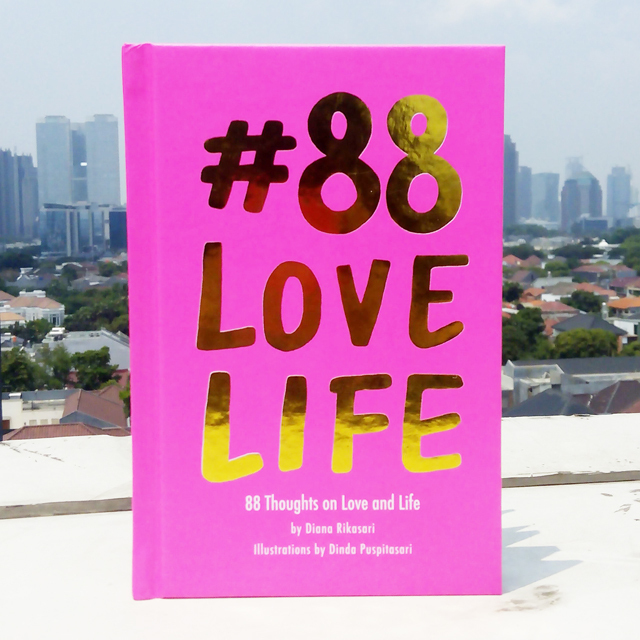 #88LOVELIFE is full of inspiring thoughts about love and life written by Diana herself. The quotes and stories were taken from her blog, so its like her seven years of blogging wrapped into one. I read all of her quotes and stories before I started illustrating. Her thoughts brought me into smile and teary eyes at the same time. 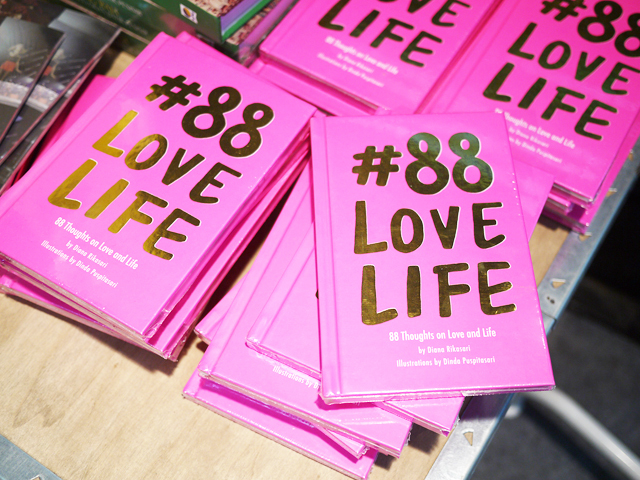 If you already have a copy of #88LOVELIFE, you can see that the illustrated girl in the book is Diana with her short short hair and signature sunglasses. Making illustrations out of her stories made me happy. I got to use the brightest colors and put so many details into my works. Nothing is ever too bright or too much when working with her. 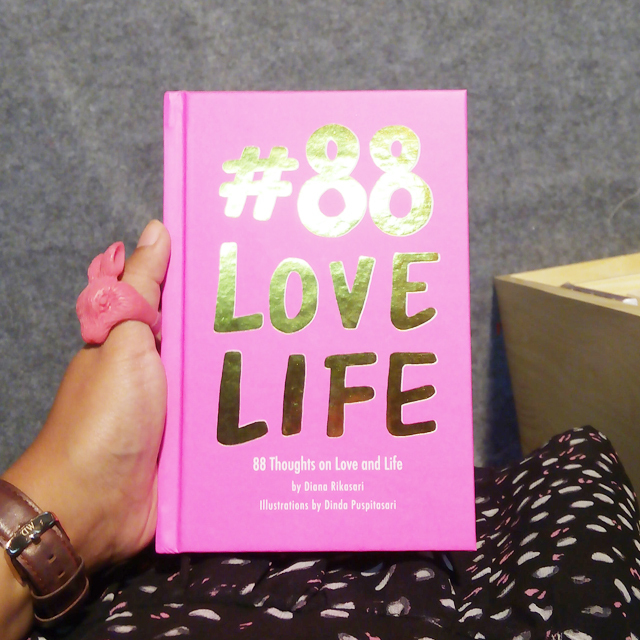 The writings and illustrations in #88LOVELIFE are Diana Rikasari's mind being printed into a book. 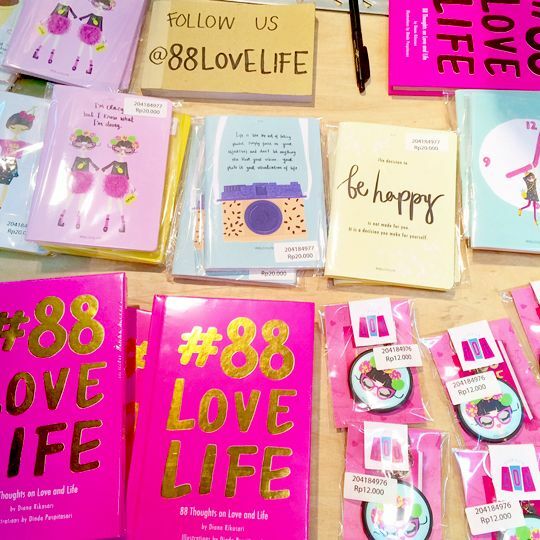 Thank you to those who came to #88LOVELIFE meet and greet last week and posting pictures on Instagram. 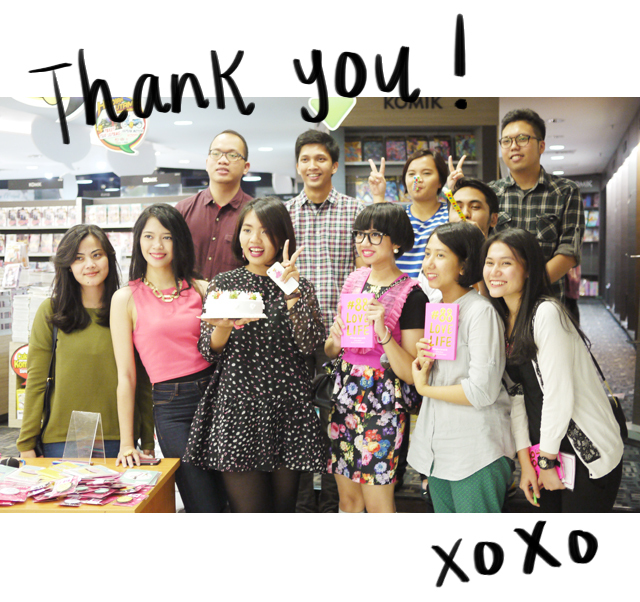 The book will be out in all Gramedia book stores by November 10th, mean while you can drop a pre order here. 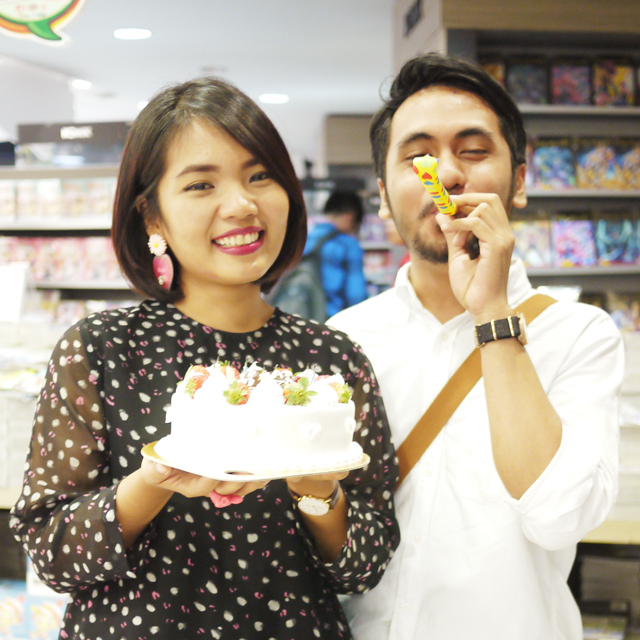 Pictures by me, Kak Diana and R.